Their albums usually include a cover version of a well-known hit song, usually sped up to the usual punk rock tempo. Covers have include: "Toccata in Dm", "Sabre Dance", "Livin' La Vida Loca", "Lazy Sunday Afternoon", "I'm Gonna Be (500 Miles) and "The Final Countdown." They have also recorded parodies of popular songs, such as "The Kids in Tyne and Wear (Kids in America)" and "The Devil Went Down to Scunthorpe (The Devil Went Down to Georgia)". Their albums often start with a short intro with a catchy guitar riff, and end with an outro, which is usually a slightly longer variation of the intro riff. Toy Dolls formed as a quartet featuring vocalist Pete "Zulu" Robson, guitarist Michael "Olga" Algar, drummer Colin "Mr. Scott" Scott and bassist Phillip "Flip" Dugdale. After a couple of concerts, Zulu left to form his own band and was replaced by Paul "Hud" Hudson on vocals for one concert. 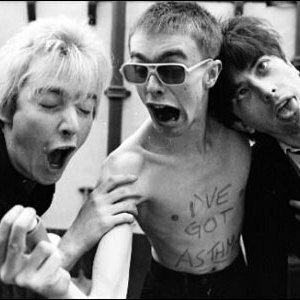 After Hud's departure, the Toy Dolls became a trio, with guitarist Olga assuming permanent vocal duties. Scott left the band in 1980 and was replaced by Dean James for four months over the summer of 1980. James later returned to the band from 1985 to 1988 as a bassist. Flip left in 1983, marking the beginning of a revolving door of drummers and bassists that would characterise the Toy Dolls line-up over the years (with Olga as the mainstay and only original member). In 1984, Zulu returned to the line-up as a bassist/vocalist, but departed again less than a year later. They were initially grouped with the Oi! scene, but they can also be classified as pop punk or punk pathetique. One reason they are associated with Oi! is that they were championed by Garry Bushell, who was very involved with Oi! bands such as Angelic Upstarts (whom The Toy Dolls later supported on their first national tour). In 1980, businessman financed Toy Dolls' debut single, "Tommy Kowey's Car" with "She Goes To Finos" on the B-side. The single quickly sold out its initial pressing of 500 copies, but the band could not afford to press any more, making the single a collectors' item. When the band signed to Volume, they moved to Newton Hall, north of Durham which led to their song "Livin' on Newton Hall". For Christmas 1982, they released their punk rendition of "Nellie the Elephant", a classic children's song, which hit #1 in the UK Indie Singles Chart. In 1983, they released their debut album Dig That Groove Baby. In 1984, their re-issue of "Nellie the Elephant" reached #4 in the UK Singles Chart and stayed in the Top 100 for 14 weeks. Their follow-up single "She Goes to Fino's" reached #93 during April 1985. As of 2007, the band has had 14 different drummers and 11 different bassists. Olga is the only remaining original member of the band. After Olga, drummer Martin Yule had the longest tenure in the band (1987-1999). Yule currently owns a shop in Sunderland called "Hotrats." Former drummer Dave "the Nut" Nuttall owns Jalape?o Drums (a custom drum company based in Lancaster, Lancashire). The current lead singer/guitarist with The Stranglers Baz Warne also had a stint with the band. Olga has played bass on some tours with the U.S. punk band The Dickies.